The holidays are near and that makes me think of fun holiday things like Transformers toy. Hasbro may have bigger plans in the works for the Transformers: Prime line at least judging by a single picture. 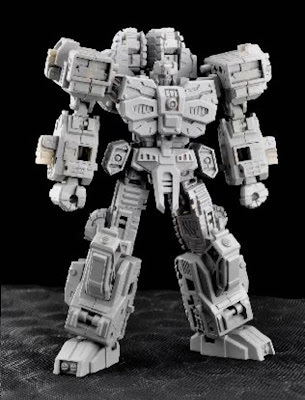 Also making plans is various 3rd party transformer makers with more images of previously known figures like not Devastator, not Shockwave, and not The Fallen. There are links to an Autobot Ukulele, articles on re-issues, and a look at not Sixshot. In the video department, we have a Kre-O commercial, TF book commercial and two reviews of two more not Constructicons. On the not so merry side there is also a potential PR nightmare for Hasbro if the mainstream media gets bored and looks into a report on one of their Chinese Transformer factories but in the meantime they are suing Asus. Based on the image above, it seems the successor to the Transformers: Prime First Edition mini-line is ready to go called "Robots in Disguise" line with red colored package (personally I like the First Edition blue more). 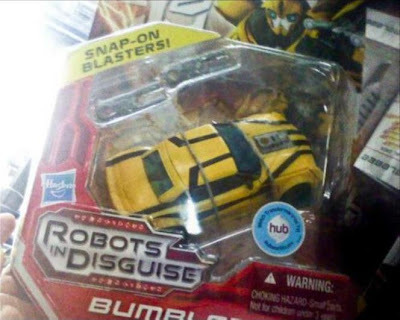 The deluxe Bumblebee seems to be a new mold. At this point I am a bit confused about the whole Prime line as far as what is being released when with what type of package (blue or RID red) but I assume the goal is to have a strong prescense on the toy aisles in time for the second season launch in Feburary. A leaked list of potential RID figures include deluxe Skywarp and Ratchet. It has been revealed that last week Hasbro has sued computer maker Asus over the name of their Transformer Prime tablet because it conflicts with the cartoon series that just recently hit the market. 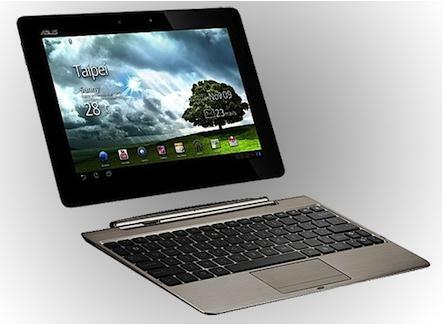 The tablet was announced in October so bit surprised it took them long to file the lawsuit. Hasbro says they are protecting their intellectual property. I think the lawsuit is a license fee grab. Typically trademark law covers categories of products (so toy category vs. technology category) where the issue a real concern over brand confusion. So technically Hasbro is making the argument that consumers will be confused about what product they are buying when getting a Transformer Prime because a tablet and toy are so "similiar". This aspect of trademark is why you can have unrelated products and companies with the same name (ex: Apple Computer, the Beatle's Apple Records). By suing, Hasbro can force Asus to settle either by changing the name (unlikely because they waited to sue until the product hit the market worldwide) or pay Hasbro a fee to use the name (normally how these things end up). In Asus' case, their product has a six month to a year shelf life at most so they could drag this out until version 3 of the tablet with a different, fully trademarked protected, name is released. 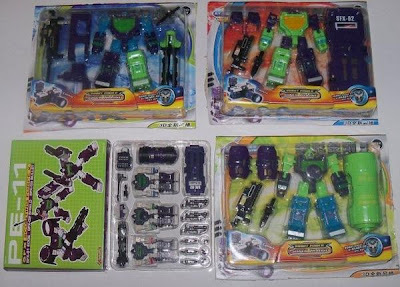 Speaking of Prime, hit the link for images of the deluxe and voyager class toys coming out in Japan for their "First Edition" line of Transformers: Prime toys. It is the Hasbro/American packaging with a Takara sticker slapped on the front. I thought the first two waves of First Edition toys for USA were redirected to Japan (so those could released here under RID) but a comparison gallery of USA vs Japan Prime toys show that once again Takara's superior attention to detail means Japan fans are getting the better paint jobs (especially Bulkhead). After months of teases and near final versions, TFC toys has finally revealed what the final version of their not Devastator (aka Hercules) 3rd party toy will look like when all 6 of the deluxe sized Constructicons are released by end of April. The result is pretty sweet looking but also a massive $600 dent to our wallet. Still, I have to admit I am strongly considering it. The removable visor doesn't hurt either. Speaking of, a gallery of the final two not Constructions have popped up online with images of the near final versions of not Mixmaster (Mad Blender) and not Bonecrusher (Neck Breaker). Hit the link for gallery and video of the upcoming movie based Transformers pinball machine that will be available for purchase from the famed manufacture. The Fallen made for a pretty pathetic toy (and movie villain). That last outing just encouraged third party TF Maketoys to do him right with a version inspired from his original Dreamwave incarnation. More interesting though is this is a combiner of sorts where his alt mode is two tanks, one inspired by his tank mode in the comics and the other from his Titanium toy from a few years ago. No idea on price (or size) but expect it to be in the $100 or more ballpark. While working on their latest, MakeToys has also prepping for the release of Hover (not Sea spray) and Bomber (not Powerglide) based on their Generation One counterparts. iGear also has their own Seaspray about to come out but this is a smaller scale version (about Legends class) and come as a 2 pack as the gallery shows. No info on price or release date. The XBox 360 Marketplace has started selling add-ons for your Avatar including virtual apparel (shirts, hats, hoodies, etc. ), companions (Laserbeak), and helmets (Shockwave, Sentinel Prime). Cost in XBox Live credits varies on what you buy. Autobot Ukulele - Pic of a custom made Ukulele using the Autobot logo. Costs $550 to get your own. It seems even the third party makers can avoid the infamous Transformer knock-offs of variable quality and odd color choices. The latest takes Perfect Effect's very cool, very tiny not Reflector combiner and duplicates it at three times the size. The result would probably be a cool set if not for the ugly color choices. Have to admit if my usual TF sites sold them, I would probably buy a set. More articles from TFSource, this time looking at the interesting re-issues of Generation One molds that have come out of Takara over the last decade. Mostly it’s just fun to go through all the pictures of these "new" classic TFs. Sometime next year Mastermind Creations is releasing their next creation inspired from the Industrial Revolution designs from the Transformers: Heart of Steel comic book called Cyclops (not Shockwave). For the last month or so they have teased images. The latest gallery is a look at his gunship alt mode. The figure is expected to be around Leader class size. No idea on price or release date but I do enjoy by Knight Morpher (not Optimus) so price is probably the only reason may not get it (until I inevitably cave). Speaking of Mastermind Creations, they also have another figure in the works. 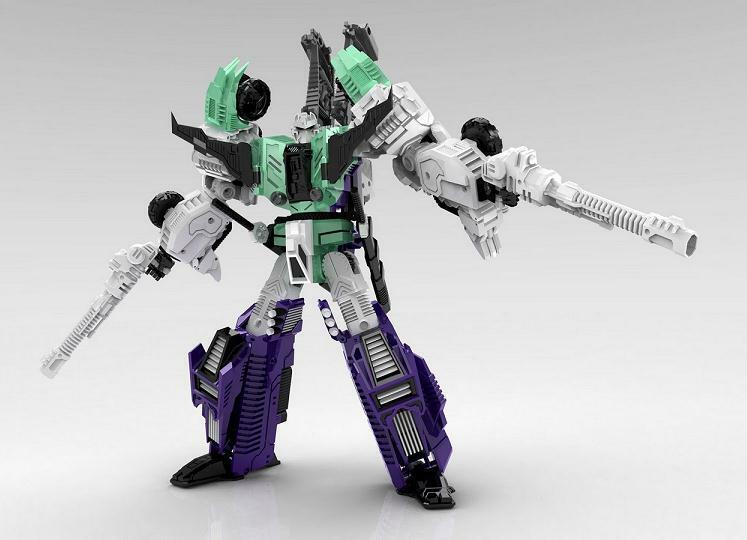 So far we just have these computer renders of Terminus Hexatron (not Sixshot) which was one of the final Generation One figures released and sported six transformations. This version seems to be a leaner, meaner and more detailed version of that toy. Again no price, release date or size. Hit the link for another set of legend class Generation One figures being released in Japan. The figures are Optimus Prime, Megatron (tank mode), Prowl, Hound, Hot Rod, Starscream, Skywarp (Starscream repaint) and Bluestreak (Prowl repaint). No idea if will get a stateside release but the volume 1 version was released by Hasbro but very hard to find so not holding my breath. 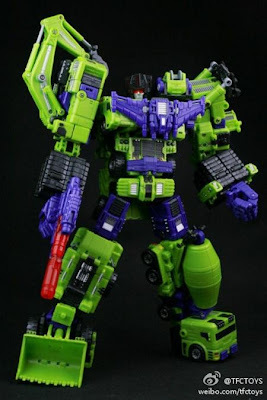 Peaugh has posted his reviews of the next two pieces for the Hercules (not Devastator combiner). The result is expensive ($100 each) but will designed and constructed toys that are perfect homages to their Generation One counterpart. The final two parts will come out in March and April. The Kre-O promotions team continues to show how to do Transformers commercials right with another entertaining video that has the Decepticons enjoying the holidays thanks to the Autobots. Amazing toys! thanks for videos, I found videos with showing it , but didn't find. Great!